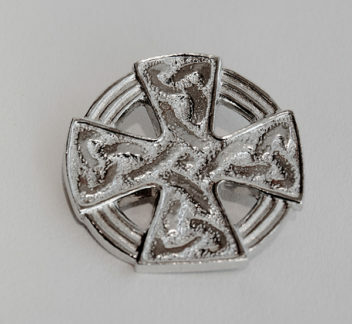 ﻿﻿Cornish Tin brooch depicting the head of the Cardinham Cross. The Cardinham Cross, at Cardinham, Bodmin Moor, dates back to the 8th century and is one of Cornwall’s most visited landmarks. Handcrafted from 100% Cornish tin, the last reserves extracted from the South Crofty mine prior to closure in 1998. Packaged in a velvet lined quality gift box with authentication certificate.